Herr Ngo, “think global, build social” is the slogan of an international development that underscores the relevance of architecture to society. Architects are addressing social and environmental policy problems, developing design-based solutions with local resources, and in doing so, distance themselves from iconic star-architecture. What examples are there in Vietnam? Project Bottle Sail | Do San | 1+1>2 International Architecture ASC | Photo: Vu Xuan Son Hanoi agency 1+1>2 places a strong focus on social architecture. 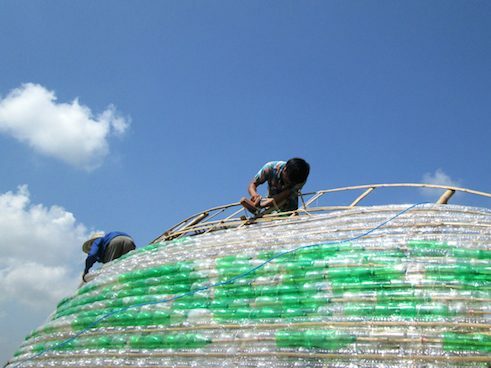 In northern Vietnam, for instance, the Bottle Sail project arose, a pavilion made from recycled plastic bottles threaded one after the other on bamboo cane. 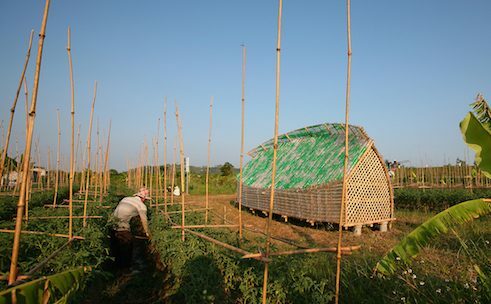 Optically, the structure suggests a billowing sail, in practical terms the bottles create a thermically active building envelope that local farmers can use to grow seedlings and thereby secure a livelihood. The background is the global problem that small farmers often are forced into dependency on Big Agriculture through the purchase of seed. Bottle Sail was realised with a budget of only 400 US- dollars and built together with HIV-infected people. In this way, the project has contributed towards making this marginalised group a part of the village community once again. 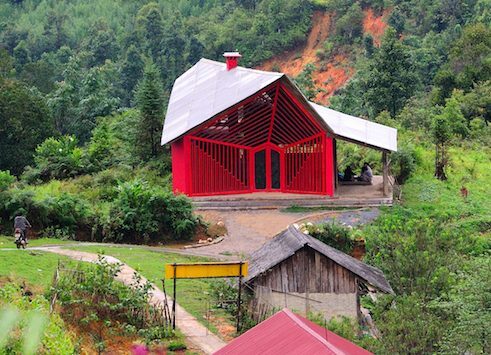 Project Bottle Sail | Do San | 1+1>2 International Architecture ASC | Photo: Vu Xuan Son Another example of the work of 1+1>2 is the Ta Phin Community House in the mountainous region of Sa Pa. The facade of this building constructed with wood, adobe bricks and corrugated sheet metal, is bright red and visible from afar. This also has a symbolic meaning, as the colour cites the headgear of the women of the local Dao ethnic minority. The construction is based on traditional building techniques, a continual cross-ventilation provides cooling for the interior rooms. New was a roof construction with skylight developed by 1+1>2, so that the interior is not dark, as is otherwise usual in traditional houses. Community center in Sa Seng | 1+1>2 International Architecture JSC | Photo: 1+1>2 What is the specific feature of social architecture? Planning projects with a very limited budget and only with locally available materials is a major challenge. Ultimately, it’s a matter of translating social requirements into contemporary architecture, in other words user-oriented buildings with a distinct design vocabulary. The specific quality of social architecture lies in its experimental approach to traditional construction methods and materials. Through creative work with limited local resources, solutions often emerge that are more sustainable and enriching than the standardised buildings that look the same all over the world. Architects for whom social relevance is important initiate projects, attend to financing and organise participatory processes. Cities are growing, traffic congestion is increasing, and densely-built metropolises are especially affected by climate change. What solutions are available? We can’t turn the clock back. Human-induced climate is a reality that we have to work with. But seeking to combat these problems with ever-“smarter” construction technology is not necessarily the best solution. What is necessary is the insight that human-induced urban climate renders obsolete the distinction between a “natural” external climate and an “artificial” internal climate. The point therefore is to develop totally new perspectives and typologies for life in metropolises, the way, for instance, the agency Vo Trong Nghia Architects in Ho-Chi-Minh-City is attempting to do. Apartment house | Ho Chi Minh Stadt | Vo Trong Nghia Architects | Photo: Hiroyuki Oki The residential project “House for trees,” built in 2014, is a model project for the integration of tropical vegetation into the dense urban structure. 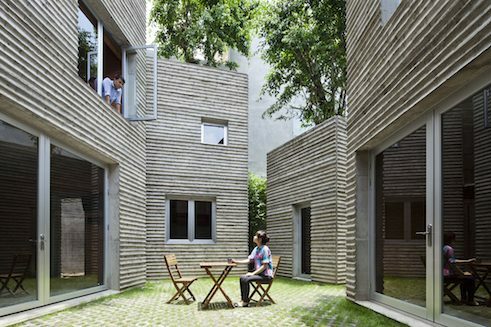 The single-family home consists of five separate building units grouped around a courtyard and suggesting oversized flower pots, since trees grow out of them from the rooftops. 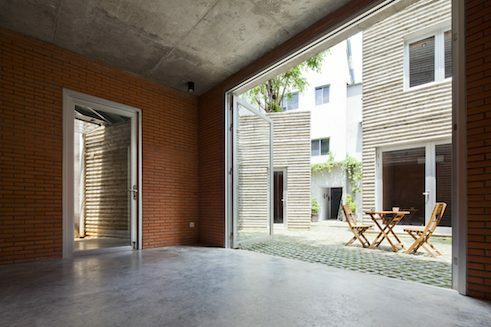 One uses the outdoor space to go from one room to another, and in this way open gaps become a part of the architecture. The residents live without air-conditioning or isolated, but instead develop an awareness that they are part of the city. Apartment house | Ho Chi Minh Stadt | Vo Trong Nghia Architects | Photo: Hiroyuki Oki For architects, this means that they not only design individual buildings, but that they must take into consideration the entire city as „interior space“. The necessary mediation between individual and community, private and public areas, between inner and outer, artificial and natural, generates more varied and complex spatial relations. You designate an experimental approach to pre-existing traditions as a criterion for quality in social architecture. What part do international influences play? In an interlinked, globalised world, they flow naturally into the work. In this connection, one must first of all mention architects Anna Heringer and Diébédo Francis Kéré, who are now stars. They are very important as role models, as they have shown that in dealing with social and climate-related problems, with the revalorisation of supposedly “poorer” materials and modes of construction, that one can arrive at a very distinctive position indeed, which is then, to top it off, internationally recognised as well. After all, as a designer one wants to achieve something, get something moving. What can western architects learn from their Vietnamese colleagues? With the two Vietnam issues of the journal Arch+, we aimed to highlight two global trends on the basis of one concrete example: the first issue, “Vietnam- die stille Avant-garde” (i.e. Vietnam – the quiet avant-garde) directs attention to a new social engagement on the part of architecture, which is proving to be the starting point of a re-founding of the discipline. The second issue, “Vietnam – Die Rückkehr des Klimas” (i.e. Vietnam – the return of climate) identifies a turn in dealing with the challenges posed by climate. Instead of working out climate-related problems in conventionally technical ways, young Vietnamese architects are solving them creatively with architectural means. In this way, the two issues on Vietnam show that in addition to social construction, climate-adapted designs on the part of architecture can open up the way to a new societal relevance for the discipline. They also call for balancing the tension between regional and universal argumentation, and recognising the pitfalls that referring back to real or supposed traditions involves. Photo: David von Becker is an architect, author and co-editor of the architecture and urban planning journal ARCH+. In 2015, at the invitation of the Goethe-Institut, he embarked on a lecture and research tour of Vietnam. In autumn 2016 the ARCH + issue “Vietnam – Die stille Avantgarde” appeared, and in February 2017 the issue “Vietnam – Die Rückkehr des Klimas“. Copyright: Text: Goethe-Institut, Elisabeth Schwiontek. This work is licensed under a Creative Commons Germany Attribution – NoDerivs 3.0 Germany license.